1498, 21st April: a letter from the ducal clerk of the court, Gualtiero da Bascapè, tells Ludovico il Moro that Leonardo is starting the decoration of the room “da le asse, cioè da la tore” (the room – in Italian “Sala” of the planks, that is of the tower) and that “Magistro Leonardo promete finirla per tuto Septembre” (Master Leonardo promises to complete it by the end of September). 1499, 18th October: Louis XII of France solemnly enters Milan, and accommodates in the luxurious ducal court of the Castle. Ludovico il Moro is then obliged to run away and the room loses its original representative function. 1535: the Spanish succeed the French to guide Milan. Since then, there is no news about Sala delle Asse for more than a century. 1706: after the Spanish, the Austrians come. The Castle becomes a barracks and Sala delle Asse is turned into a shelter for artillery horses. 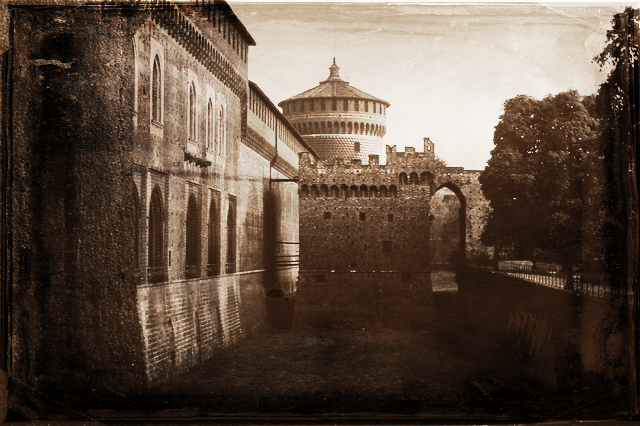 1893: the Castle becomes a property of the municipality of Milan. 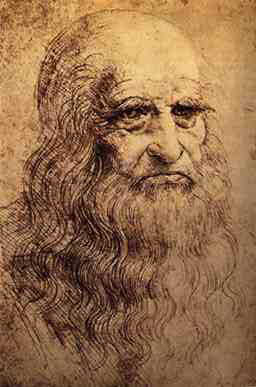 The first restoration actions started, during which the scholar Paul Müller-Walde, while taking away the plaster, found some painting traces that were attributed to Leonardo Da Vinci. 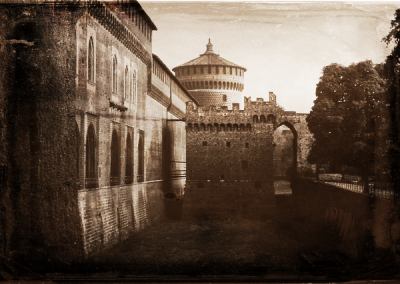 1901: the person in charge of the restoration works of the Castle, Luca Beltrami, architect and representative of the Kingdom, assigns the decoration charge of Sala delle Asse to the painter and decorator Ernesto Rusca who, according to the restoration idea of that time, largely repainted the pictorial surface. 1902: the restoration of Sala delle Asse is presented to the public. Immediately, disapproval is strong: Adolfo Venturi, a famous art critic, asserts “Questo non è più Leonardo, questa è una Gambrinus Halle” (This is Leonardo no more, this is rather a Gambrinus Halle). 1954: the second restoration of Sala delle Asse starts. On October 14th, Costantino Baroni, the director of the civic museums of Sforza Castle, writes “è stato autorizzato il restauratore Ottemi della Rotta ad effettuare sondaggi in tutta la superficie della volta affrescata di Sala delle Asse, allo scopo di accertare quanto dell’originaria stesura leonardesca potesse sussistere dietro la generale ridipintura che sul principio di questo secolo fece il pittore Rusca” (the restaurer Ottemi della Rotta has been appointed for carrying out all the needed probes on the whole vault’s surface of Sala delle Asse, to verify how much of the original painting by Leonardo is still living behind the repainting by Rusca, which was made at the beginning of this century). 1956: the second and last restoration of Sala delle Asse comes to an end. And the paintings by Rusca are nearly completely taken away.